Preparatory works for a new £15 million hospital to serve the people of Skye and Lochalsh in Broadford are on course to begin next week. An early site test scrape has already taken place to identify any potential archaeological risks that could impact construction on the site. From Monday, a team from the AOC Archaeology Group, including an ecologist, will supervise as mechanical diggers remove vegetation and topsoil from the site, located between the existing Dr Mackinnon Memorial Hospital and the Broadford Health Centre. 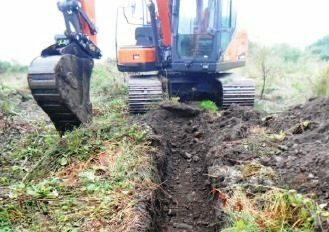 Diane Forsyth, NHS Highland’s senior project manager, said: “During the first week, the ecologist will survey the soil and vegetation excavated from test ‘scrapes’. “Then staff from AOC will begin supervising the stripping of the area in stages in order to minimise the amount of earth destabilised on the site. “Some terracing will be required because of the site’s hill slope. “After this initial work, both the ecologist and AOC staff will then set tree protection zones. As the work progresses, they will also continue surveying and monitoring the site. Full construction works of the new community hospital hub are expected to begin midway through 2019. Some key archaeological finds were established during the construction of the neighbouring Broadford Health Centre in 2011, with specialists identifying an intriguing cairn-like structure, with an underground stone-lined passage known as a souterrain dating back to the Iron Age, sometime around 600BC to AD 500.